Dividend reinvestment plans, or DRIPs, are one of the most effective tools for income investors to build wealth. History has shown that a long-term, buy-and-hold approach to stocks is arguably the best way for regular people to grow their investment accounts and achieve financial independence. But what many people don’t realize is the importance of dividends to achieving these impressive results. 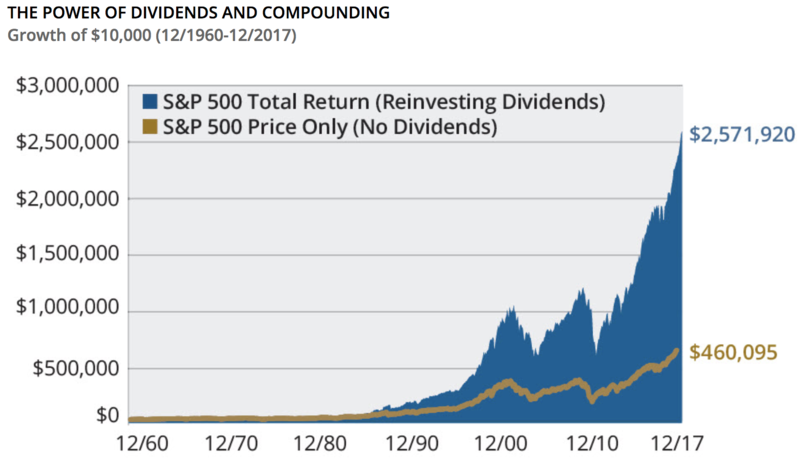 Since 1930, over 40% of the stock market’s returns have come from dividends, according to the Hartford Funds. However, as you can see below, dividend reinvestment is the real fuel to the market’s long-term compounding. To that end, dividend reinvestment plans can be a great way to ensure that your money is working as hard as possible for you. Let’s take a look at this valuable dividend investment method to see why DRIPs might be just the thing to help boost your long-term returns and help you meet your financial goals. DRIPs are merely an automated strategy in which a company’s dividends are reinvested into additional shares of that company. Instead of being paid dividends in cash, you get additional shares of ownership in the company. There are three ways to get involved in DRIPs: directly through the company, through your broker, or through a transfer agent. Company-run DRIPs are generally only available through large, blue-chip dividend stocks. That’s because smaller companies don’t want to take on the overhead costs of tracking all their shareholders and going through the paperwork headache of calculating how much each one gets in dividends and additional fractional shares. The company benefits from gaining an additional source of capital, but most of all in creating a more stable base of shareholders, ones who are less likely to panic and sell during a market decline. This can help decrease the volatility of a company’s shares. As a result, more and more companies are deciding to use transfer agents, which are third-party DRIP administrators such as American Stock Transfer and Trust or Computershare. Finally, most large discount brokers, such as Scottrade, TD Ameritrade, and E*Trade, also offer DRIPs, though with different requirements and limitations (which we’ll get to shortly). There are three primary benefits of participating in DRIP plans. First, a DRIP can often be the most cost effective and efficient means of compounding your wealth. 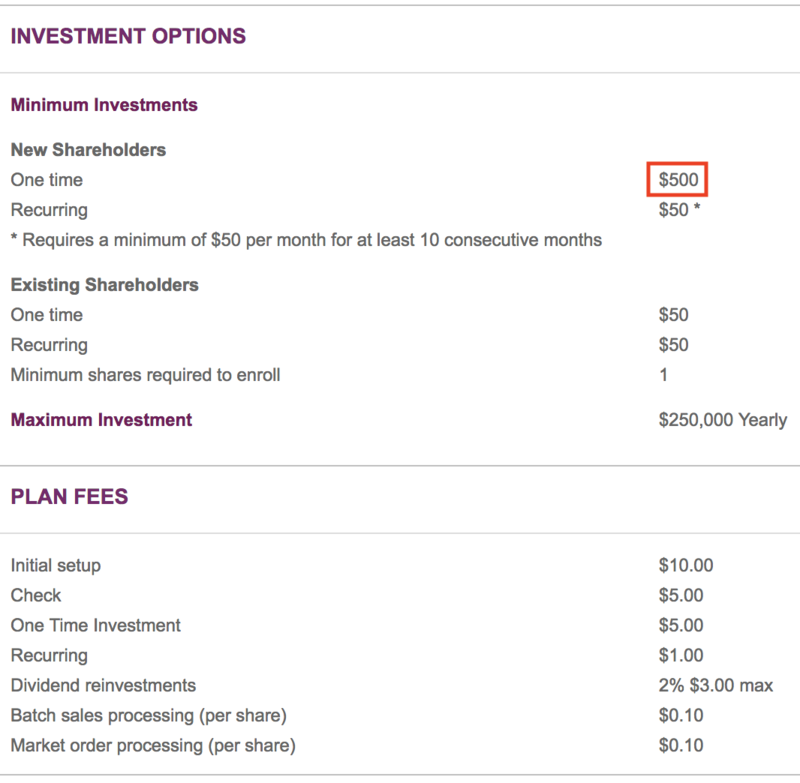 For example, many DRIP plans are commission free and most even allow for fractional shares. This means that all of your money is constantly working for you and growing exponentially over time instead of sitting idly in cash. The second major benefit is that some companies offer discounted shares (typically 1% to 10%) if you sign up for their DRIP. This can be a powerful means of generating much stronger returns over time, but without any of the risks that come with traditional means of boosting returns, such as leverage. For example, one of the safest, high-yield Master Limited Partnerships (MLPs), Enterprise Products Partners (EPD), offers a DRIP that automatically grants participants up to a 5% discount on new units. The reason Enterprise offers this discount is that it creates an incentive for investors to hold units for the long term (and thus decrease stock price volatility). In addition, those investors participating in the dividend reinvestment plan represent a means of decreasing how much actual cash needs to be distributed each quarter. In other words, when investors accept distributions in new discounted shares rather than cash, companies retain more cash to reinvest into future growth. However, the biggest benefit of reinvesting dividends is simply that it’s automated, which helps investors to take emotions out of their investing decisions. History has taught us that this is often the most important thing that can improve one’s returns over time. Specifically, Buffett is talking about market timing and over-trading, two huge mistakes that investors often do and that can cost millions in the long-run. Rather than trying to time the market, legendary investors such as Buffett use a strategy called time arbitrage, in which they buy great companies at fair or undervalued prices (taking advantage of short-term market irrationality), and then sit back and let the company grow over time and appreciate in value (price eventually approaches intrinsic value). How does DRIP investing help you to avoid the pitfall of market timing? That’s thanks to the beneficial effects that occur when you run your portfolio like a business and keep emotions to a minimum. The reason that market bubbles form (and inevitably crash) is largely because of human nature (i.e. emotion). During a bull market almost all stocks are rising, and getting rich relatively quickly seems easy. Of course, regular investors who were burned during the last bear market are skeptical and stay on the sidelines, certain that shares are overvalued and just waiting to crash. As the market continues to rally, fear of losses gets replaced with fear of missing out and eventually investors end up buying into the rally, generally only after all the reasonable profits have been made. Essentially, greed eventually gets the most skeptical investors in, right at the top, and then a correction, bear market, or outright crash occurs. As the saying goes, stock rise on an escalator but drop in an elevator (i.e. shares decline much faster than they rise). That’s due to loss aversion, a psychological principle that says that it hurts twice as much to lose a dollar as to gain a dollar. This explains why stocks fall so quickly, because investors panic and focus on the short-term pain, rather than the fact that market pullbacks represent great long-term buying opportunities. DRIP investing is a form of dollar cost averaging, a strategy in which you invest consistently into the market over time, no matter what share prices are doing. Better yet, during times of peak market panic, when shares are selling at fire-sale prices, dividend reinvestment plans can ensure that you are buying at the right time (when share prices are lowest and yields highest). Locking in high yields during market crashes helps to raise your yield on invested capital over time and is why dividend growth investing, when executed through a buy-and-hold strategy utilizing DRIPs, is one of the best long-term wealth creation engines. In other words, the key to long-term returns and income growth is to change one’s mindset, by adopting a long-term buy, hold, add on dips, and reinvest the dividend strategy. Don’t fear volatility, embrace it as an ally; the key factor that separates bad investors from good, and good from great. As great as it is to invest your money into a diversified portfolio of quality dividend growth stocks, set a DRIP, and then just let your portfolio run on auto-pilot, there are a few downsides to consider. First, because DRIP investing is a form of dollar cost averaging, it can at times be a suboptimal strategy. For example, during strong bull markets your dividends will be buying potentially overvalued shares with much lower dividend yields. Ideally, assuming you could minimize commissions, you could achieve better long-term income and total returns by investing not necessarily into the same stock that pays the dividend, but whatever is most undervalued in your portfolio at that time. After all, even when the market is overheated, generally there is always some beaten down sector creating reasonable buying opportunities for long-term investors. Of course, that only applies if you are a hands-on investor who has the time, and most importantly, the temperament to be tracking a watch list of quality dividend growth stocks without panicking over short-term drops. For the vast majority of people, DRIPs are ideal. Unless you have mastered your emotions and learned how to invest with iron-like discipline (according to a time-tested, simple investment process tailored to your own needs), then DRIPs let you invest your money on a regular basis and completely ignore the market. Studies have shown that tuning out the market is the best way for regular investors to maximize long-term returns. 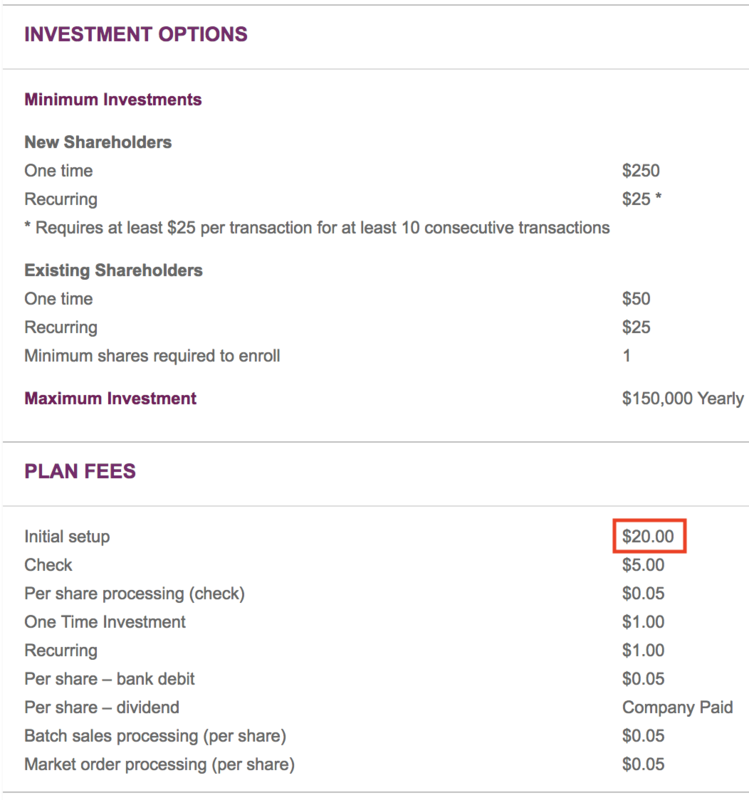 The second drawback to dividend reinvestment plans is the fees that you may end up paying. Note that not all DRIPs have fees, but those that do require you to be very careful about how you set them up. For example, both McDonald’s (MCD) and Walmart (WMT) offer DRIPs but charge $5 to set up a DRIP and then $5 plus 15 cents per share each time you reinvest the payout into new shares. A minimum investment of $50 is also required. Transfer agents also charge fees, which can vary by company. For example, Computershare, one of the most popular transfer agents, has varying charges and minimum funding requirements depending on what stock you want to enroll in a DRIP. As you can see, setting up a DRIP for Walmart will cost you more than going through the company directly ($5 vs. $20). On the other hand, a Johnson & Johnson (JNJ) DRIP costs nothing to set up, has a low minimum funding requirement, and offers very low reinvestment costs ($1 each time). 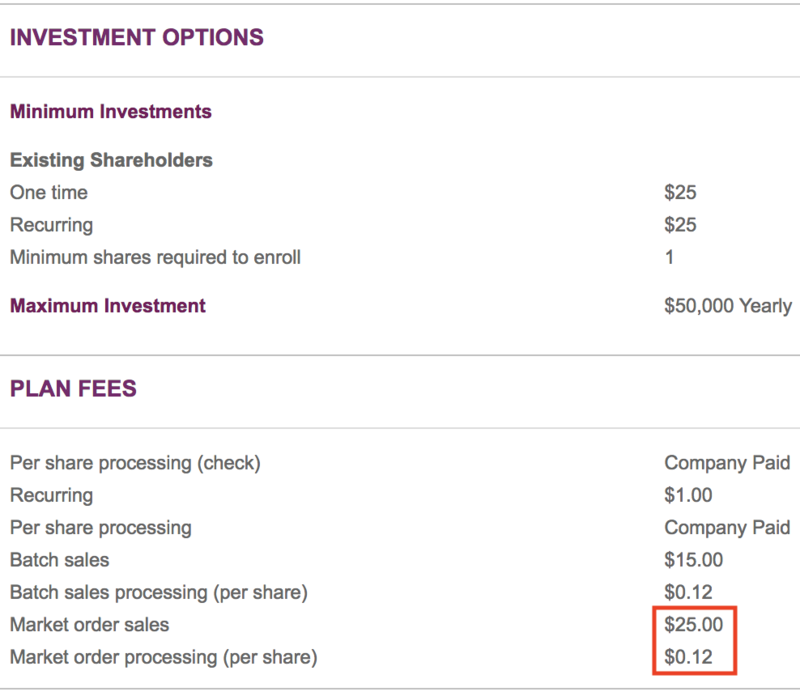 However, you will pay a $25 commission to sell shares, in addition to a 12 cents per share processing fee. You also need to keep in mind that if you are planning on using a DRIP without setting up a monthly direct deposit, some companies, such as IBM, require an initial investment of up to $500. And what about brokers? Things are equally complicated depending on what broker you use. For example, TradeKing allows dividend reinvestment plans to be set up on any security with an average trading volume of 50,000 share. You can choose to enroll individual stocks in a DRIP or have the broker set up your entire portfolio to DRIP all at once. Another benefit is that you can own fractional shares, so you know that none of your money is sitting idle. The bottom line is that there are many ways to set up a DRIP, and your fees will vary. If you want to get the lowest costs, you will likely have to go directly to individual companies, which can be a chore especially since a properly diversified portfolio usually consists of at least several dozen companies. Also keep in mind that the shares you get via a DRIP are taken out of a company’s share reserve, not purchased directly from the market. This means that in order to sell the shares, you have to sell them to the company directly, at the market price (thus explaining the high commissions to sell). In addition to the higher fees, it also creates lower liquidity if you want to sell a large portion of your portfolio because you might literally have to put in sales orders with dozens of companies. Although a DRIP allows you to be paid in shares instead of cash, the IRS still treats your dividend as taxable income. For most C-corps such as Pfizer (PFE), Microsoft (MSFT), or ExxonMobil (XOM), these are qualified dividends, meaning they are taxed as long-term capital gains (0% to 20% depending on your tax rate). Note that DRIPs for Real Estate Investment Trusts (REITs) are non-qualified and thus taxed at your top marginal tax rate. However, tax reform resulted in a new 20% pass-through deduction that applies to taxable REIT dividends, lowering their maximum effective tax rate from 37% to 29.6%. DRIPs on Business Development Companies (BDCs) are a mixture of qualified and non-qualified (mostly non-qualified) but this can change year to year. MLP DRIPs are the most complicated of all because of the way MLPs are structured for tax reasons. Their DRIPs will be mostly paid in return of capital, which will lower the cost basis on the new units you receive. You won’t actually have to pay taxes on this until you sell the units (or your cost basis hits zero). The most important decision about whether or not to DRIP a stock comes down to how stable the company is and what your investment goals are. For example, for most high quality dividend stocks, the business is generally predictable enough that you can take a very hands-off approach. However, for certain equity classes, such as BDCs, mortgage REITs (mREITs), and higher risk MLPs, DRIPs are generally a bad idea. That’s because these are stocks whose business fundamentals, and thus dividends, can vary wildly. If you choose to own them, you need to make sure you maintain a close eye on their financials over time. Aside from the type of company, deciding if you should start a dividend reinvestment plan also depends on your phase of life and corresponding investment goals. One of the biggest benefits of DRIPs is their ability to compound wealth over the long term. However, many dividend investors depend on dividends to supplement their retirement income. They are more focused on preserving their capital and generating current income. DRIPs are less appropriate for the distribution phase of life. Sure, an investor in need of income could still pick to DRIP and periodically sell shares to generate cash, but this introduces market risk. Instead of cashing dividend checks from safe dividend stocks and not having to worry about market prices, this investor has the added stress of trying to decide which investments to sell and when to sell them to raise cash. Taking the dividends and not reinvesting them can make more sense in most of these cases. How to Select the Best DRIP Stocks? ETFs are actually decent DRIP candidates because they generally represent automatic diversification, which means that you don’t have to worry about any individual company failure causing a large and permanent impairment to the dividend. This is especially true for large cap dividend ETFs such as the Schwab U.S. Dividend Equity ETF (SCHD), which offers exposure to 100 blue chip dividend growth stocks with solid financials. In addition, with an ultra-low expense ratio below 0.1% you don’t have to worry about fees causing you to significantly underperform over time. Other solid dividend ETFs include the Vanguard Dividend Appreciation ETF (VIG), which focuses on quality dividend payers with a consistent history of payout increases, and the iShares Core High Dividend ETF (HDV), which offers the best mix of high-yields from strong, wide moat companies as defined by Morningstar. As far as individual companies go, the best DRIP stocks are generally blue chip names that you are confident will be around for decades, generate consistent free cash flow , and that you feel comfortable not monitoring except every quarter or every year. A decent place to start looking is the dividend achievers group, which are stocks that have at least 10 years of consecutive dividend increases under their belt. This tells you that the company is not just financially stable, but also more likely to have a dividend shareholder-friendly corporate culture that is likely to endure changes in management, as well as various economic and interest rate cycles. Dripinvesting.org also provides a list of no-fee DRIPs for the cost-conscious income investor to consider. Our Dividend Safety Scores, which are available for thousands of stocks and identify companies with the greatest risk of slashing their dividends in the future, can also help investors avoid certain investments. Reinvesting dividends into companies that cut their dividends or have risky business models is extremely dangerous. Instead of enjoying the long-term benefits of compounding, DRIP-ing into lower quality dividend stocks can have the exact opposite effect. DRIPs can be excellent to use if you are investing with a long time horizon and in high quality businesses, which Dividend Safety Scores can help identify. As long as those stocks aren’t trading at really excessive prices, a DRIP is a reasonable way to go if current income is not needed. For most investors, dividend reinvestment plans represent a great low cost way of putting their investment portfolios on auto-pilot and are certainly worth taking part in, especially if you are a hands-off investor (which most people should be). Just make sure you choose carefully how you set up each DRIP to keep costs to a minimum and stay focused on high quality companies that are aligned with your investment goals and risk tolerance. Even for more hands-on, active investors who like to track different individual companies, DRIPs generally will be lower cost than manually reinvesting dividends, unless your broker allows commission-free trades (Robinhood or certain brokers offering commission-free dividend ETFs). Just be sure you understand that dividend reinvestment plans are designed as an automation tool, and thus should only be used for high-quality dividend growth names that you would feel comfortable “setting and forgetting".